All relationships start with a greeting, and the warmer and more welcoming the greeting, the better the chances of a good, strong and long-lasting relationship. The Zulu word kunjani is such a warm and welcoming greeting. And at Kunjani Wines in the Bottelary Hills outside Stellenbosch, this simple greeting leads to a glass of wine between friends, new and old, and food to complement the wine and celebrate the occasion. 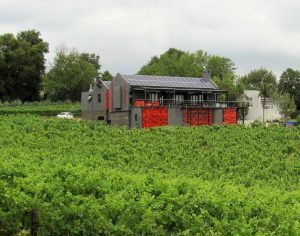 One’s first view of Kunjani Wines, the restaurant and tasting room above the vineyards. But Kunjani is much more than a friendly greeting or good wine. 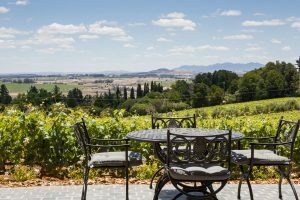 It’s another jewel in the Stellenbosch Wine Route’s already extensive crown which also offers visitors fine cuisine and great accommodation … and spectacular views. 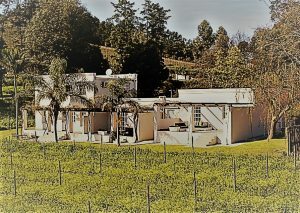 Kap Vino Estate, the home of Kunjani Wines, is nestled high up the northern slopes of the Bottelary Hills above Devon Vale. 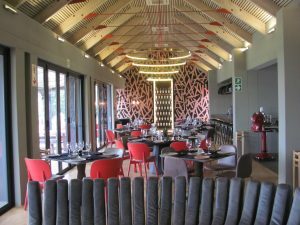 As one drives up Blumberg Drive, one’s first view of Kunjani is its visually impressive and colourful restaurant and tasting room situated above a block of vineyard. 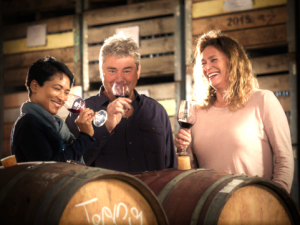 Kunjani’s three musketeers, Carmen, Paul and Pia, hard at work in the cellar. But how did this newcomer to the Stellenbosch wine scene come about? Well, a chance encounter brought together a German entrepreneur, Paul Bath, and a South African business woman, Pia Watermeyer. Their relationship has proven that with good wine, even language and culture barriers can be overcome! The wines tasted (and thoroughly enjoyed) during our visit. The award-winning winemaker, Carmen Stevens, who’s responsible for creating Kunjani’s wines, is currently also mentoring Pia in the art of making wine. And they’re not just doing it for themselves! 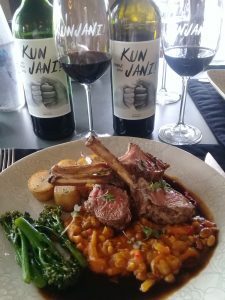 Kunjani is truly a boutique winery with only 2½ hectares under vine, all shiraz, while Carmen also has access to nearby cabernet sauvignon and merlot vineyards. Grapes for their other wines are sourced from elsewhere, while the riesling on offer is imported from Germany. A place to enjoy good food, good wine and good views … in the company of good people! We were recently privileged to experience not only their food and wine, but also the accommodation. Our visit started with lunch during which our friendly and professional waitress also gave me a tutored tasting of Kunjani wines. The tasting started with the Kunjani Chenin Blanc 2017, followed by the 2015 Dry Riesling, the 2017 Rosé (a rather unique and flavourful blend of cabernet sauvignon, merlot and shiraz), the 2014 Shiraz and the 2015 Red Blend (a Bordeaux blend of cabernet franc, merlot and malbec). 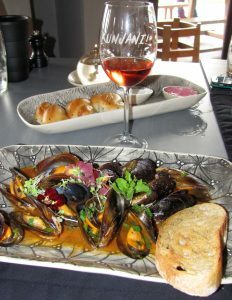 My mussel starter with that delightful salmon coloured wine with the interesting name. and the strawberry and raspberry flavours of the Rosé, to the spicy and meaty Shiraz with its black berry and plum flavours, and finally the Red Blend’s ripe cherry and tobacco flavours. And what a journey it was! My wife’s starter – it looks so good because it tastes so good! And just in case the wines weren’t good enough to sell Kunjani (they were, believe me, they were! ), Chef Lamek Mnisi made doubly sure by serving up a lunch that was! Lamek, with the help of Pia Watermeyer, has developed an “east meets west” cross-continental fusion menu which will take your taste buds on a sensory journey. 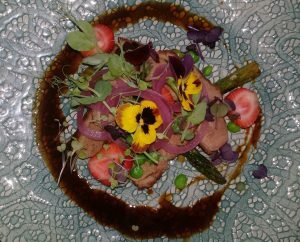 I started with Mussels in Tomato, Chilli and a White Wine Sauce, while my once, twice, three times a lady settled for Roasted Duck Breast with Rooibos Reduction, Grilled Asparagus, Strawberries, Pickled Red Onion and Micro Herbs. Suffice to say, this was an excellent start to lunch! Although I found the chilli slightly on the hot side, I nevertheless enjoyed the mussel starter, while my wife gave the roasted duck the thumbs up. “It’s oh so juicy and flavourful,” she beamed. Tender, juicy, flavourful, and that’s just my mains! The wines added to the delight. Lamek’s abilities in the kitchen. Copy that! The three luxuriously appointed and semi-detached cottages. The dessert was a colourful and flavourful end to a lunch we won’t easily forget, and for me, the wine played a big role in making the whole dining experience exceptional. Then it was time to retire to our accommodation for the night. Kunjani Wines offers 4 self-catering cottages, conveniently close to Stellenbosch and not far from Cape Town, with breath-taking views. We were booked into the very spacious and well-appointed Shiraz cottage. Shiraz, Merlot and Cabernet are semi-detached cottages, with the first boasting two bedrooms, 1½ bathrooms, a spacious open-plan kitchen, dining room and lounge, and a small patio to relax with a glass of Kunjani wine while the sun sets. Merlot and Cabernet are slightly smaller, while Stolen Chicken (it shares a very interesting story with the wine of the same name) cottage is separate. The stunning view from our cottage is also the view from the restaurant. After a good night’s sleep, we made our way back to the restaurant where Lamek had prepared a feast to set us up perfectly for the rest of the day. It was a visit worthy of a repeat! 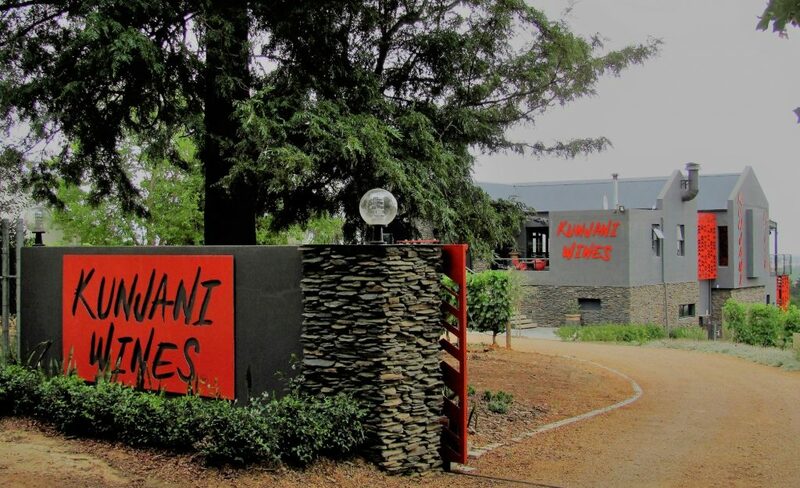 In a highly competitive wine tourism market, Kunjani Wines is a fresh breeze and a must visit destination. Do yourself a favour! 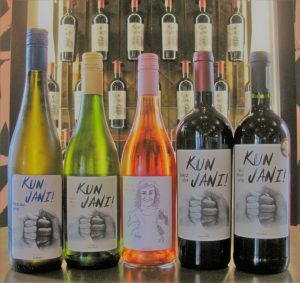 To find out more about Kunjani Wines’ many offerings, contact them at 087 630 0409 or info@kunjaniwines.co.za, or visit www.kunjaniwines.co.za.